Gold fell $2 last week from $1292 to $1290 having hit a high of $1,296 and a low of $1,281. In sterling terms gold finished the week at £989 that’s down £2, and in Euros it closed at 1,149 Euros that’s down 2 euros. Silver fell 4 cents from $15.15 to $15.11 having hit a high of $15.21 and a low of $14.92. In sterling terms, it closed at £11.59, that’s down 3 pence and in Euros it closed at 13.47 euros, that’s down 0.03 euros. The Dow Jones closed on Friday at 26,424, up 40 points on the day and up 496 points on the week, and the NASDAQ closed at 7,938 up 46 points on the day and up 209 points on the week, and the S&P 500 closed at 2,892 up 13 points on the day and up 58 points on the week. The dollar index stands at 97.39 that’s up 0.11 on the week. On that very note where is the dollar collapse and stock market route that Peter Schiff and Greg Hunters interviewees and all of the rest of the band of merry pumpers were predicting just a couple of months ago – it was imminent as we recalled was it not? It must have been because so many YouTube channel commentators were also following in line repeating the same old epithet while we once again stood out against the crowd and although advised caution CLEARLY pointed out that such a collapse was very far from imminent. We don’t say this to be smug, we say this because we know what we are talking about and do not have a vested interest to misguide our viewers and subscribers in taking action which potentially could hurt them financially or are just amateurs repeating the words of these sages of financial wisdom who since 2011 have got it very wrong indeed. Anyway, that’s our rant over back to the gold market. Last week we saw gold see-saw virtually all week within a $15 range – not particularly exciting and despite good non-farm payroll job figures but poor average wage increases there was little reaction. $1275 and $1280 are important support levels and $1300 is seen by some technical analysts as resistive. Dollar strength has undoubtedly kept gold in check which many conclude is attempting to go higher. We are quite frankly unexcited at this stage as its all about the dollar for the moment. Some forex traders are stating its over bought and can see a little weakness ahead and we would not argue with this. That said, stock markets are once again gaining momentum because they see cheap money ahead and this will keep gold prices in check also. Silver once again moved similarly to gold and as we have often repeated, from an industrial perspective which represents almost 60% of demand, we do not see this level strengthening in view of the global reduction in forecast GDP and industrial growth figures. Therefore, silver’s buoyancy is predicated on it moving in sync with gold as a monetary metal and unless we see greater take up of this, we can only envisage rather tepid silver prices for the forthcoming months ahead. Now let’s be clear on this, we do not see a silver price crash, but we also do not envisage a rapid rise in price either – at least not short term, unless of course the proverbial black swan re-enters our economic waters. On comparative grounds, the US looks strong when compared with Europe, the UK and most of the emerging market economies and therefore the dollar will be, at least for now, the ‘go to’ currency to which many will flock in the case of an emergency. Jim Rogers has frequently stated this over the years, and we agree with him. Technical analysts are to be candid a little confused over silver’s direction. If the US dollar is overbought then they see it strengthening, however if the Euro/Dollar pair does not hold up, they see silver prices falling. Either way most are agreed silver is currently range bound with $14.50 at the low and $15.50 at the high with $15 representing quite a solid floor allowing only a few incursions for a relatively short period. Well last week we saw Nonfarm payrolls for March showing 196,000 new jobs vs an estimated 177,000 but we also saw average hourly earnings rise by 0.1% against an expected 0.3% with the unemployment rate remaining fixed. Friday – Consumer Sentiment Index for April expected to stand at 98 vs 98.4 the previous month. We may see some slight movement depending on the core inflation results and the producer price index, but we envisage not a great deal of change as the results are likely to be close to expectations. So how do we see this coming week? Well, possibly slightly firmer gold and silver prices especially if the dealers are correct about an overbought US dollar, however the fiasco over BREXIT in the UK and its effect on Europe could potentially further weaken the Euro and sterling against the dollar. Either way, we do not foresee any dramatic change as yet for those who are quietly accumulating should continue to do so and for those who are awaiting better prices, at least in US dollar terms, in our view there may indeed be a better opportunity ahead. Last night we conducted our 5th illuminati Silver webinar which included I.S. Controversially Greg and Journo Marcus. 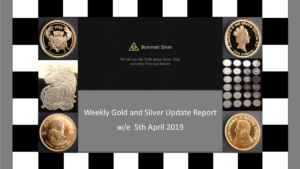 The webinar was actually 1.5 hours long and focussed very heavily on Brexit and its ramifications for Sterling, the Euro and the US Dollar and therefore the potential impact on gold and silver prices. It is our intention on this occasion only to release this for everyone to listen so that you can witness for themselves the quality and level of debate that goes on within the Inner Sanctum and is available to Silver Members. Also, it is planned to have a new Forum layout on display which we are hoping will enable members to buy and sell gold and silver and other precious metals between one another; and this will go up either on Friday or at the very latest early the following week.